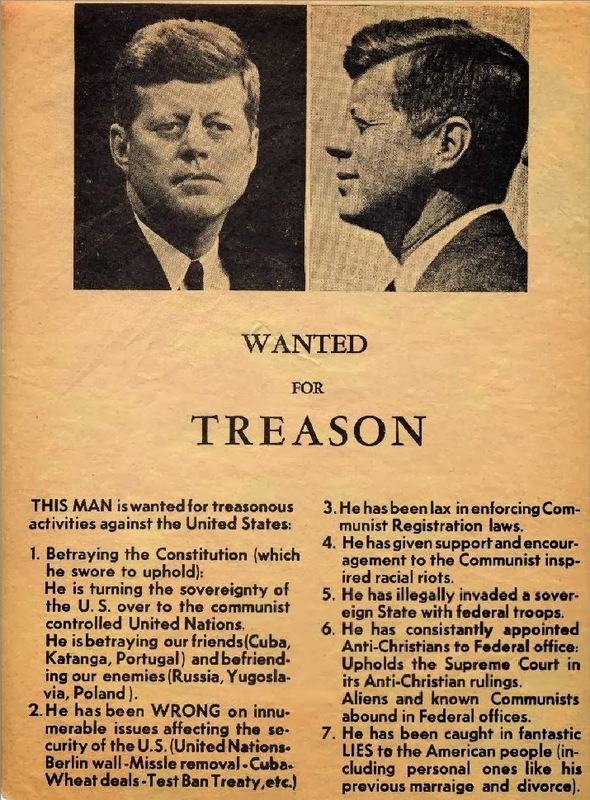 Flyer handed out by the John Birch Society the day before President Kennedy was assassinated. 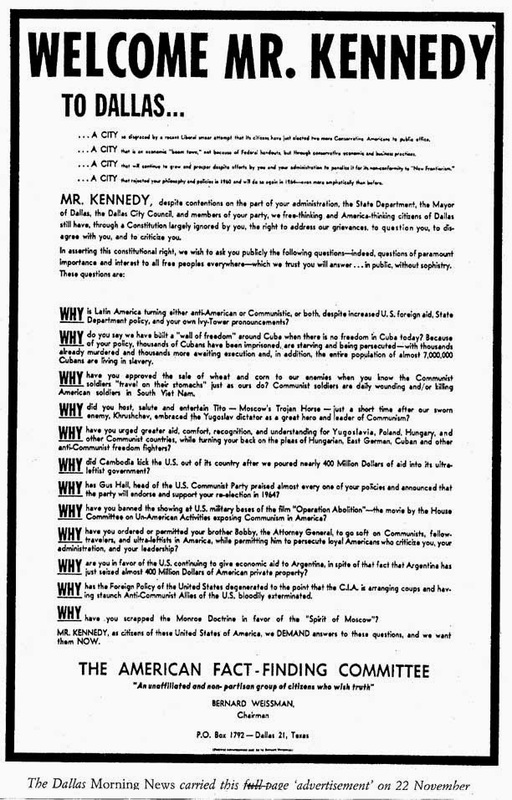 "The day before President Kennedy was assassinated, the Dallas area was peppered with flyers, and a full-page ad (below) was run in The Dallas Morning News. 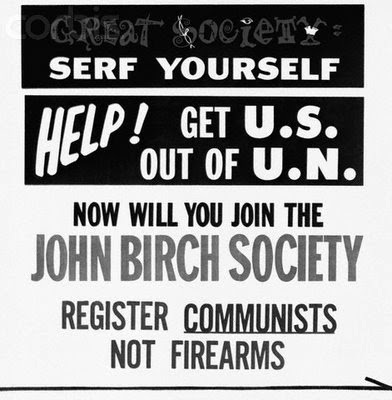 The John Birch Society was dedicated to destroying the president, and had a wide range of conspiracies against him over his Irish Catholic roots. 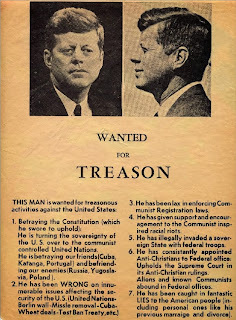 "John Birch Society advertised its hatred. 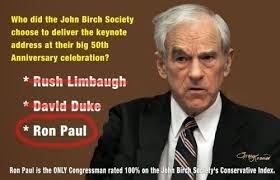 "The grandfather of the Tea Party movement, the John Birch Society is a staunch anti-American organization. 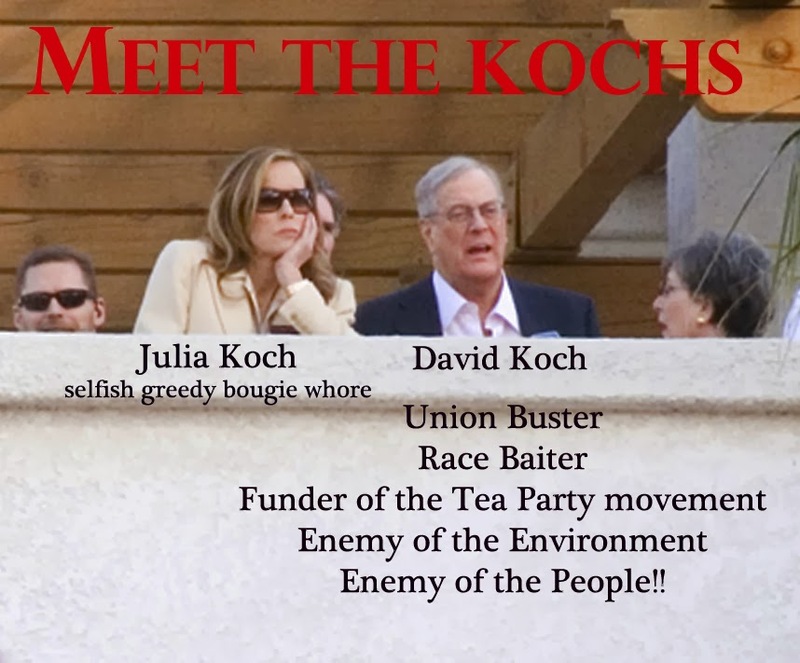 Funded by the Koch family, the John Birch Society was adamantly against democracy, and democratically elected leaders. 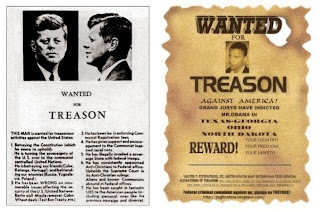 As seen in the lead-in image above, the John Birch Society declared what was treason, and not; that they were superior to the Constitution and the government itself. This sounds very familiar, let us compare against Tea Party flyers handed out not too long ago. 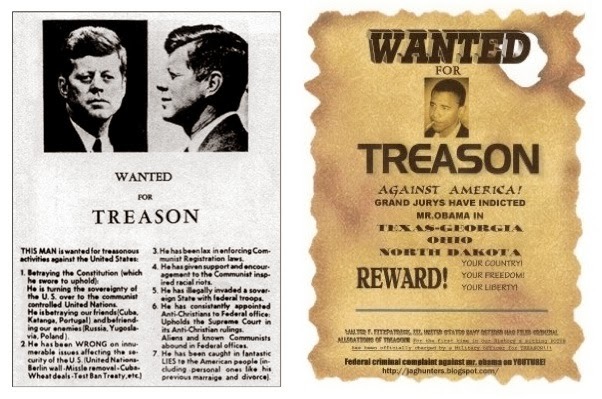 "The death of the president broke the John Birch Society stranglehold on politics. "Those sympathetic to the John Birch Society celebrated for a short period after the assassination. Then the upswing in public mourning made it unacceptable to celebrate in the wake of his death. 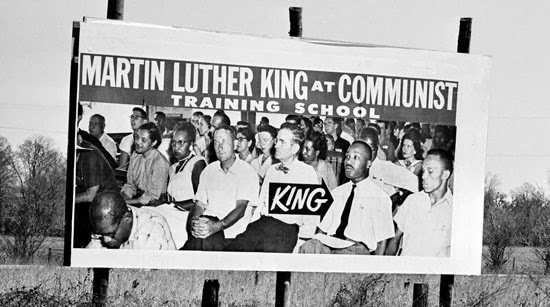 In Biloxi, MS, for instance, the John Birch Society headquarters there had a local university student Thomas Hansen chew them out for their banners of celebration. They then shoved him through the front door glass and had him arrested for vandalism. Public shame had the charges dropped, and Mr. Hansen sported the scars from the glass door as a proud badge of honor. "In the interests of full disclosure, Thomas Hansen is the authors step-father. "This is the 50th anniversary of the death of Camelot. The assassination of JFK was not only the death of the president, it was the death of innocence for our nation. We can hang much of the trouble we as a nation have faced as a result of this event, and on the evil men and women of the John Birch Society." 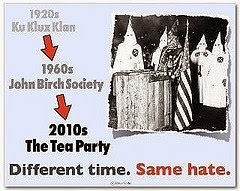 "The Tea Party is basically just the new face of the old discredited John Birch Society. "If you compare Tea Party ideology with JBS ideology, they’re virtually identical. "It was the JBS who started the right-wing hysteria about Black Helicopters back in the ‘90s, claiming the U.N. was 'taking over national parks.' The JBS also ranted about fictitious Russian tank battalions massing on the Mexican border awaiting orders from Clinton to invade the U.S.
"The JBS was behind most of the right-wing wack in the ’90s: Y2K would be the end of the world, UPC codes were the 'mark of the beast,' the Clintons were Communist moles, George W. Bush would bring on the Rapture, etc, etc. "The JBS started the denial movement. Holocaust denial, moon landing denial, Evolution denial, Climate Change denial, just to name a few. 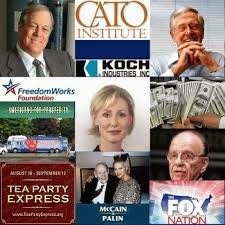 "Today, Tea Party wack about Obama’s birth certificate, or that he’s the Antichrist, or a reptile from outer space, etc. ; nonexistent FEMA concentration camps, death panels, etc, etc, is all churned out by the same fruitcakes & PR outfuts that have been dreaming up all that right-wing idiocy for decades. "That none of it ever turns out to be true never phases them; they just keep gushing it out like broken oil pipelines. "The JBS was started in the late ‘40s to whip up hysteria about the 'red menace.' It led to one of the most disgraceful periods in American history, the McCarthy Era Witch Hunts, when many thousands of patriotic Americans were hounded out of their jobs and careers simply because they had joined organizations opposing the Nazis during the ’30s and ‘40s. "During the ’60s, the JBS was totally discredited and receded from the spotlight. "But today, if you pry up the rock the Tea Party sits on, you’ll find the John Birch Society squirming to hide from the daylight." There's even more to the John Birch Society for history buffs, as Wikipedia's entry on the fringe group noted, "The society was established in Indianapolis, Indiana, on December 9, 1958, by a group of 12 led by Robert Welch, Jr., a retired candy manufacturer from Belmont, Massachusetts. Welch named the new organization after John Birch, an American Baptist missionary and United States military intelligence officer who had been shot by communist forces in China in August 1945, shortly after the conclusion of World War II. Welch claimed that Birch was an unknown but dedicated anti-communist, and the first American casualty of the Cold War. "Fred Koch, founder of Koch Industries, was one of the founding members." 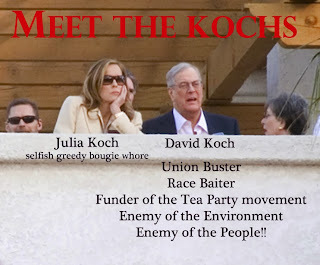 Yes, that Fred Koch - the father of today's money man behind the Tea Party, the Koch brothers. "Most John Birch Society scoundrels are buried deep in the recesses of American history, known only to politics junkies, history wonks and me, a Birch kid. "There is one exception however, a Birch name that echoes across today’s political landscape: Fred C. Koch, founding member and national council member. "Koch supervised the refinery installations, traveling extensively across the country over three years. He claimed that his hatred for Communism grew out of his Russian experiences, but he had pocketed $500,000 (his part of the company’s profits) before his outrage set in. That money, $8,000,000 in today’s dollars made Fred Koch a very rich man. 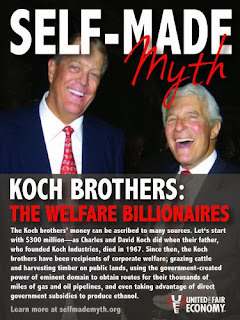 "Ironically, the wealth of the Koch family came from a brutal Communist dictatorship. 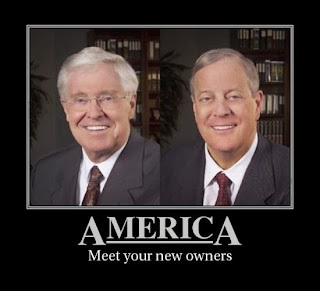 Hardly the image of 'free enterprise' the Kochs invoke so passionately. "In 1960, thirty years after he took Communist money and parleyed it into an even bigger fortune, Koch wrote his book, A Businessman Looks at Communism, in which he rails against labor unions and civil rights efforts as part of the Communist plot to take over America. "My father, who served on the John Birch Society National Council with Fred Koch, had identical views on labor unions. 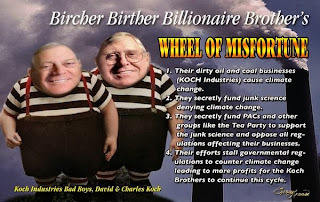 "Koch’s views on civil rights were identical to those of the John Birch Society. 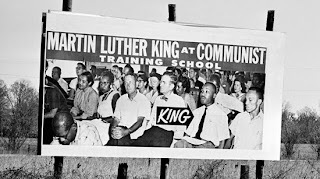 Early in the civil rights movement, the Birch founder labeled Dr. Martin Luther King a Communist and marshaled the Birch leadership to fight every piece of civil rights legislation. "Fred Koch died in 1967, leaving his company and his vast fortune to his four sons: Freddie, Charles, David and Bill who spent the next twenty years battling over the estate. Eventually, David and Charles emerged with control over Koch Industries, one of the largest privately-held corporations in the country. The sons acquired dozens of companies and diversified their fossil fuel assets into every commodity from silicon chips to toilet paper. Koch Industries continues to build its corporate wealth (and the Koch brothers’ personal wealth) with government contracts and government tax breaks. "The Koch brothers have enormous personal fortunes, somewhere around $40 billion dollars each in net worth. They are investing hundreds of millions of dollars in their favorite causes, right-wing, libertarian, anti-government ones. "David identified himself as the wallet behind Americans for Prosperity, the big umbrella for Freedom Works and the Tea Party. Charles founded the Cato Institute, a powerful think-tank specializing in selling right-wing policies on everything from taxes to entitlements. "Their father must be proud. They’re re-shaping the United States into the kind of country Fred wanted―a country with a pint-sized federal government and none of the expense of Social Security, Medicare, Medicaid or any other social program. 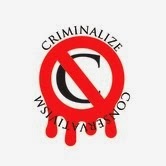 "This libertarian utopia would free businesses to make a profit unrestrained by regulation. Corporate taxes and taxes on the rich would be tiny, allowing vast accumulations of wealth for the wealthy. Workers incomes would be set by corporations without the requirements of minimum wages and union scale. 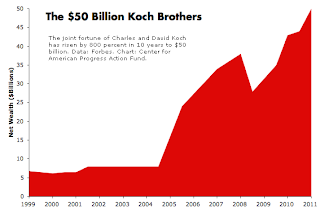 "If my father were still alive, he’d be crowing at the momentum ofI the Koch machine. I can hear him. "The ultimate irony of the Koch Brothers is this: they are spending hundreds of millions of dollars to subvert the country that helped make them so fabulously wealthy." 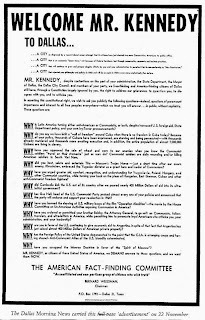 I had the dubious honor of meeting Richard Schmidt, the leader of a radical Conservative group in Dallas, Texas called "CUSA," or "Conservatism USA," around a year after the JFK assassination. He claimed authorship of the now-infamous "Black Border" ad that led to his group and the JBS foundering after that disasterous p.r. gaffe. Schmidt tried to proselytize me for some reason I still haven't quite figured out, but Schmidt was an interesting study himself. Stationed by the US Army in West Berlin, he and some of his army friends read and talked about Hitler's Mein Kampf, which motivated Schmidt enough that when he was discharged he formed CUSA with a long-term game plan which he shared with me on the day I met him: the takeover of the United States by CUSA. The game plan started with getting control of Congress, then the White House. But the assassination change all that, funding ceased from the JBS and the Hunt brothers, an earlier version of the Koch brothers, and Schmidt fell into the dustbin of history, never to be seen again. (Nelson Bunker Hunt is still a member of the JBS (http://en.wikipedia.org/wiki/Nelson_Bunker_Hunt).